Fill bowl with purified water and raw organic walnuts. Soak in water for 6 hours. Drain walnuts removing excess water. Food process dates, walnuts, raw organic cacao powder until mixture is smooth. Be sure to scrape sides as needed to keep mixture moving and evenly mixed it sometimes will stick on the sides of the processor. Pulse until mixture forms into a dough ball with tiny bits of walnuts remaining. you will know its done when the mixture becomes shiny. Take mixture into an 8-inch square dish pressing down evenly with wet fingers. Refrigerate 6 hours until chilled. Cut into squares. Keep in freezer until ready to serve. This delicious fudge is a sweet treat without the guilt of most desserts. The recipe makes wonderfully rich and moist chocolate squares that make the perfect dessert. Be sure to keep them in the refrigerator as they will keep their shape better this way. They are great for get togethers as well as gifts for family and friends. 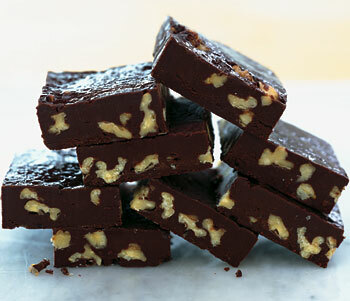 Once you introduce these be prepared to make more as you will get endless fudge requests.